2015 – Cottbus | Abgefahren e.V. Print, hang up, spread the word! As always we meet at Friday (May 22) for a chilly preliminary meeting. Participation is optional, but it is a good opportunity for first-timers to get last questions answered and connect to other participants. Also participants who registered alone can find a team partner during this meeting, because we hitchhike in teams of two during the race. The preliminary meeting takes place on May 22 from 4 p.m. at Stombad Cottbus. There you can also camp from Friday evening to Saturday morning. The Strombad is located at Stromstraße in Cottbus at the west coast of the river Spree, opposite to the soccer stadium. 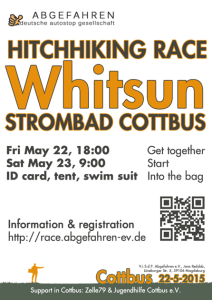 The Whitsun Race starts on Saturday (May 23) morning at 9 a.m. (on time). The staring point is also Stombad Cottbus at Stromstraße (see Get together). Prior to the start the last teams can be set up and last organisational questions can be answered. Short before the starting shot the destination is announced and then we race-hitchhike there in teams of two.